Heraldry, Vexillology, and ... Sumo Wrestling? ‘Oh, I don’t know. But he’s got to have it. All the nobility does.’"
Has the blazon confused you yet? Yeah, me, too. Fortunately, there’s a drawing that was done that may – well, probably not – help you sort it all out. Proof once again, as if we needed it, that a little learning can be a dangerous, or at least confusing, thing. 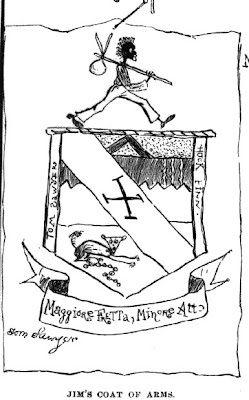 But what an amazing piece of American "heraldry."